Condition: New พอทตัดคอยล์ Bourns®USA 250K Push/Pull DPDT POTS เป็นพอทคุณภาพสูงจาก USA for Fender, Gibson, PRS, Jackson and USA guitar Made.BOURNS®PDB183-GTR01- 250K SHORT Push/Pull split shaft audio taper potentiometers. 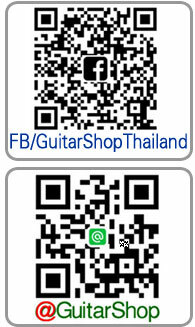 สินค้า:Guitar Potentiometer	ผู้ผลิต:Bourns inc USaรุ่น:PDB183-GTR	ความต้านทาน:250 kOhms	ชนิด:Audio	ประเภทส่วนประกอบ:	Carbon	ประเภทเแกน:Knurled / Serrated	ประเภท:Rotary Metal	ประเภทสวิทช์:Push Pull	เส้นผ่าศูนย์กลางของด้าม:6 mm	ความยาวของด้าม:19 mm	.. 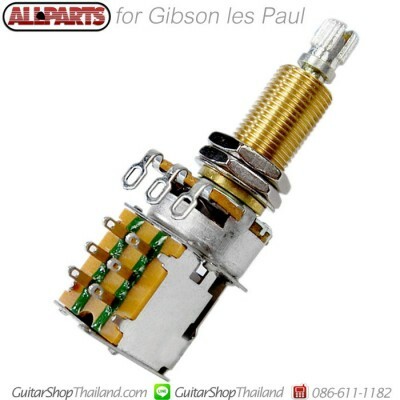 Condition: New พอทตัดคอยล์ Bourns®USA 500K Push/Pull DPDT POTS เป็นพอทคุณภาพสูงจาก USA for Fender, Gibson, PRS, Jackson and USA guitar Made.BOURNS®PDB183-GTR01 500K SHORT Push/Pull split shaft audio taper potentiometers. 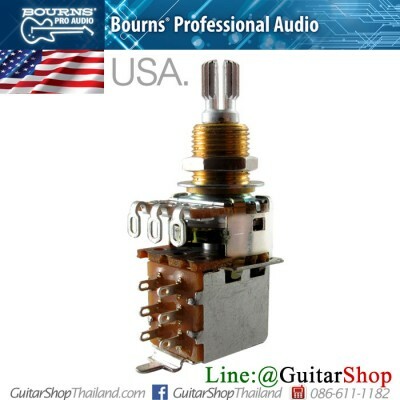 สินค้า:Guitar Potentiometer	ผู้ผลิต:Bourns inc USaรุ่น:PDB183-GTR	ความต้านทาน:500 kOhms	ชนิด:Audio	ประเภทส่วนประกอบ:	Carbon	ประเภทเแกน:Knurled / Serrated	ประเภท:Rotary Metal	ประเภทสวิทช์:Push Pull	เส้นผ่าศูนย์กลางของด้าม:6 mm	ความยาวของด้าม:19 mm	จ.. 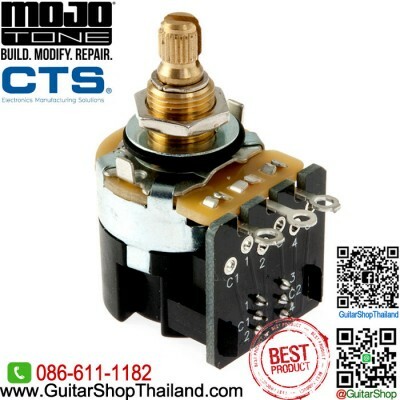 Condition: New พอทตัดคอยล์ CTS®USA 500K Push/Pull DPDT POTS This is the best push-pull potentiometer on the market. These aren't your standard off the shelf CTS pots either. We had them custom made to our specification to have the smoothest taper possible and the tightest tolerance available. The switch contacts are side-mounted which makes them ready to drop into most guitars without the need for deeper routing. There are a number of wiring options with these pots .. Condition: New พอทตัดคอยล์แกนยาวแบบกดสำหรับกิ๊บสัน เลสพอล Gibson Les Paul Push-Push Linear Pot B500K Long Shaft , US spec threads and a 24-Knurl Split Shaft. Blend push-push pot with solder teminalsSwitch type: D.P.D.TShaft : knurlNut diameter : 3/8"Button to before bushing Height : (27.8m/m)2nuts & 1washerShorting typeBy Allparts USA. 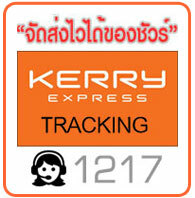 *กรุณาตรวจสอบขนาดและรายละเอียดของสินค้าให้แน่ใจว่าตรงกับสิ่งที่ท่านต้องการก่อนทำการสั่งซื้อ ..